Some revelations which say a lot about the real intentions of the Algerian regime concerning the Western Sahara issue. The support of the White House to the Moroccan autonomy proposal expressed in 2007 and qualified afterwards of being “serious and credible” was not at all, to the taste of the Algerian authorities, at their head, President Abdelaziz Bouteflika. 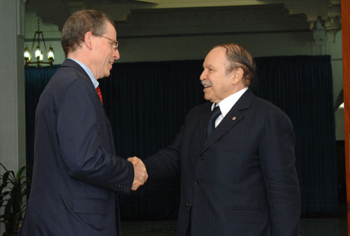 A diplomatic telegram written in June 2008, and recently published by Wikileaks, relates a part of negotiations between the American Ambassador in Algiers, Robert Ford and President Bouteflika concerning the Western Sahara. The diplomatic note describes the Algerian President as being irritated by the ever increasing support by the United States to the Moroccan autonomy plan for the Saharan provinces. In fact, the powerful men of the Algerian regime are also angry against the French for their support to Morocco. But the recrimination of the President won’t sway the diplomat Robert Ford, an expert in the Arab issues who knows perfectly well French and English and who was working in Algiers from 2006 to 2008, before being nominated n°. 2 in the US embassy in Baghdad. During his confidential discussions with Bouteflika, Ford turned down the proposal of self-determination through a referendum which seems to him in a deadlock, to support the pragmatic autonomy plan which would allow the Sahrawis in Tindouf camps to get out of their status as refugees. Whereas, the Algerian President, like the other army powerful executives who are governing the country with an iron hand, won’t give up. He states that self-determination of Sahrawis is a question of principle. The American ambassador defended also the choice of his country for an autonomy to the image of the Kurdes in Irak, but Bouteflika raised an objection by pleading for the keeping of the statut-quo while waiting for “a progress through different stages, even if it would take time” While Ford explained to him that it is not acceptable to see this conflict still continuing another thirty years, the President holds on to his position and does not drop it out. “It would take the time needed”, insisted the Algerian President. Robert Ford tells in his note that Bouteflika has entrusted him that he wanted « to find a means to get out of this deadlock ». But it was not known whether he referred to the Polisario deadlock situation or that of Algeria drawn into a trap while remaining stubborn in defending the separatist thesis of the Polisario and hosting the refugees camps on its territory in Tindouf. Ambassador Ford reached the conclusion that there was “simply no creative idea here (in Algeria) about the mean to reach “ a negotiated settlement for the Western Sahara issue. Bouteflika and his companions may likely take their secrets with them in their grave, because what was not said is more important than what Wikileaks has just mentioned.